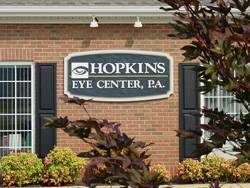 Conveniently located on South Highway 14, Hopkins Eye Center is open 5 days a week. Call us to make an appointment with our Greenville Optometrists to talk about your eyeglasses, contact lenses or specialty lens needs. Or just drop in anytime to browse through our large selection of designer eyeglass frames or sunglasses. Hopkins Eye Center was established in 2003 to serve Greenville South Carolina and surrounding areas. From Columbia: Travel north on Interstate 385, exit Woodruff Road (exit 35) and turn right. Head east approximately 3 miles to South Highway 14 and turn left (there is a McDonald’s on your left at the intersection). Hopkins Eye Center is the third building on the right from the intersection. From Downtown Greenville: Travel south on Interstate 385, exit Woodruff Road (exit 35) and turn left. Head east approximately 3 miles to South Highway 14 and turn left (there is a McDonald’s on your left at the intersection). Hopkins Eye Center is the third building on the right from the intersection. From Anderson/Atlanta: Travel north on Interstate 85, exit Woodruff Road (exit 51A) and turn right. Head east approximately 4 miles to South Highway 14 and turn left (there is a McDonald’s on your left at the intersection). Hopkins Eye Center is the third building on the right from the intersection. From Spartanburg/Charlotte: Travel south on Interstate 85, exit Highway 14 (exit 58) and turn left back over the Interstate. Head south on S. Highway 14 approximately 5 miles. We are on the left side, just before you reach Woodruff Road.